I’m sorry……so much has happened, but I am back! wow! I can’t believe that I haven’t posted since last summer. I am so sorry, but so much has happened that I was overwhelmed with life in general. I am getting ready to return to Croatia in one month, and this time I will only be there for three months, during which time Becki, Jude and I will be taking a cruise along the Adriatic Sea and visiting Croatia, Greece and Turkey. Be sure to tune in to my posts as I will definitely be posting new pics and posts on our adventures. This past winter has been very trying as I have had to deal with bad weather ( like many of you) and I lost a very important part of our family, my little boy doxie, Maddie. It has been only three weeks since he crossed over the Rainbow Bridge, but the pain of not having him in my life is still very raw and real. My health is good, my attitude better, but my emotions have been ripped raw by dealing with Maddie’s passing as well as family issues that never seem to go away. I have just finished a three week road trip in my RV that has taken me into some beautiful spots in Arizona and Southern California and I will be home tomorrow in time to start preparing for this years trip to our other home in Donja Stubica, Croatia. Thank you for staying with me and I wish you all the best……see you again real soon! 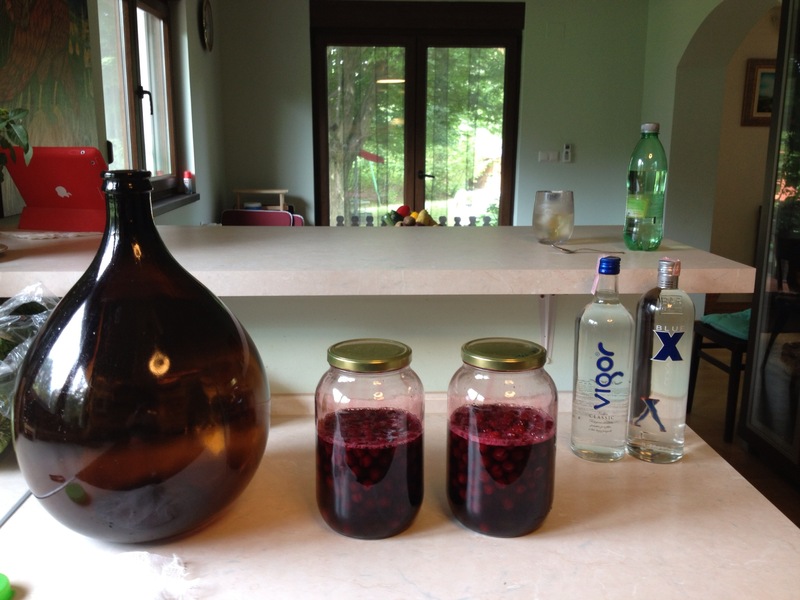 It’s been a few weeks since I posted and I wanted to catch you up to date on the making of the sour cherry liqueur called Visnja or Visnjata. If you missed Part One, just scroll down through my earlier posts to find it and then you will be all caught up! 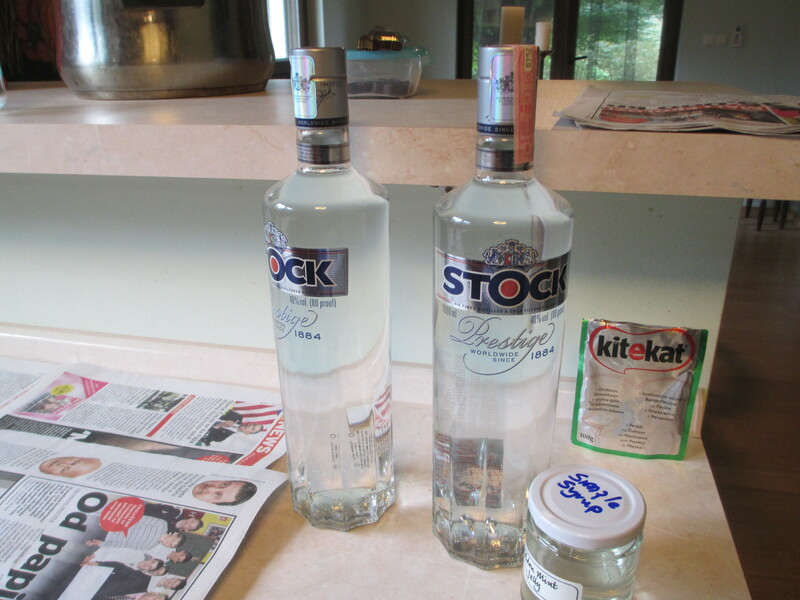 I use a large dark bottle to make the final product, and I use local vodka for the alcohol in my liqueur. You can use rakija ( or moonshine, as it’s known in the US) but it is too sharp a taste for me. I like to have a smooth, sweet cherry taste instead of something that tastes like cough syrup, so I use vodka. 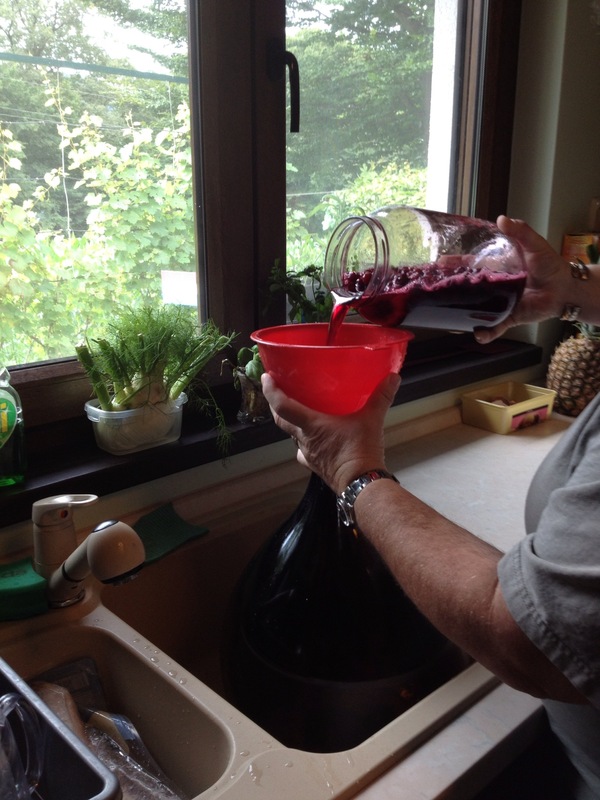 I pour the cherry mixture into the large bottle, pits and all, without straining anything. Once that is done, I add the two bottles of vodka and swish everything around so as to get thoroughly mixed. Next, I cap the top with cheesecloth so I can let any remaining fermentation gasses to escape, and then I store it away in a dark room for three months. 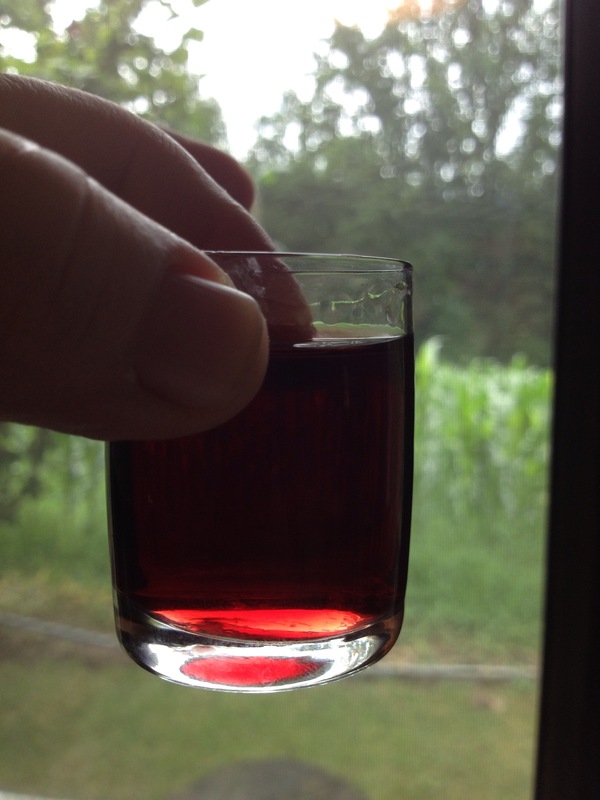 At that time I will strain out the pits and bottle the fantastic tasting cherry liqueur. These next two pictures are of last year’s batch, but I wanted to show you how it turns out. It tastes as good as it looks! Just for looks, I usually add a couple of the cherries at the bottom. You can use the cherries ( after you remove the pits) in fruitcake, or make a heavy syrup and add them for a topping for ice cream. You can also dry them and eat plain. Don’t throw them out as they are really good unto themselves! This is pretty simple to make, but it takes time, and the wait is well worth it! Enjoy!! 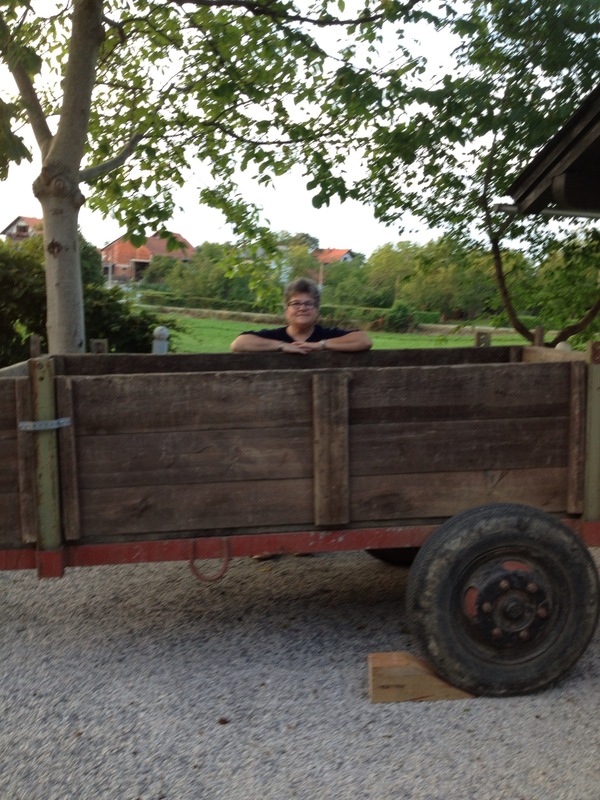 The wagon to haul away all the waste from construction arrives and is parked in our driveway. 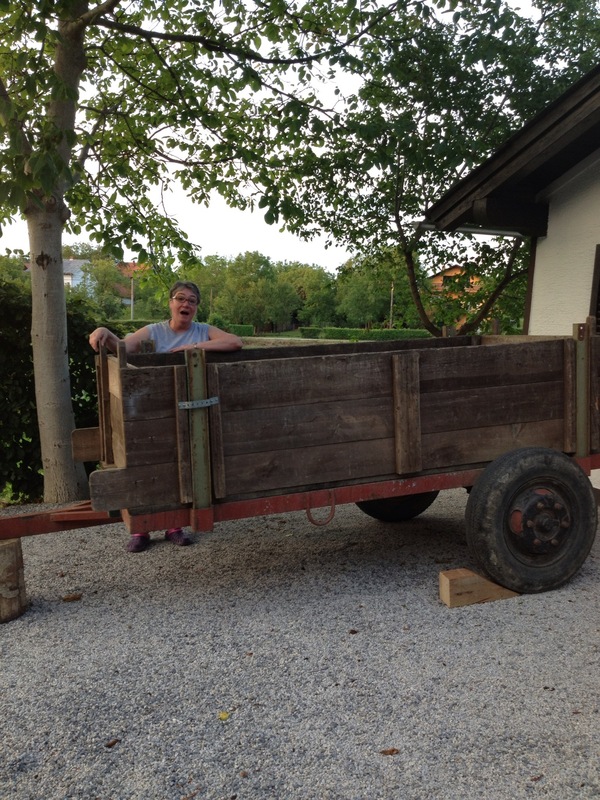 Becki and I had fun posing in front of this wagon which has seen a lot of action in its life. 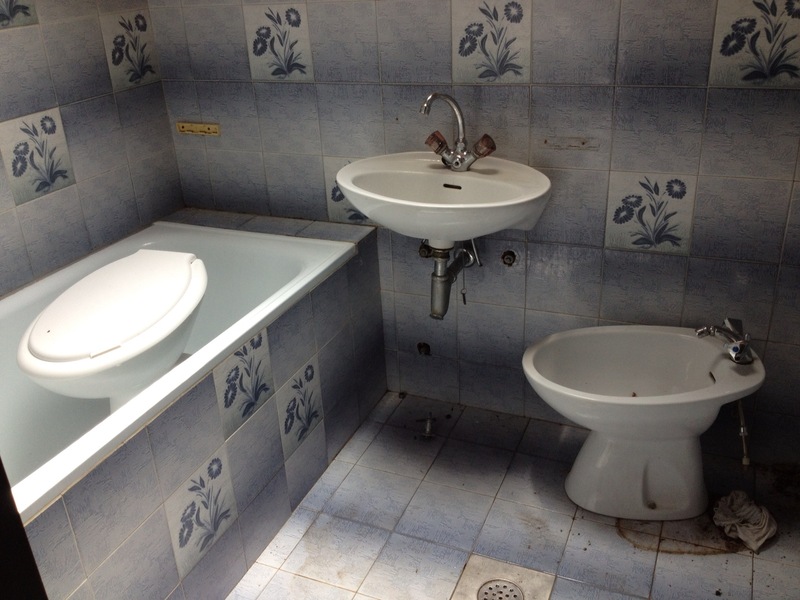 Here is a picture of the old tub, sink toilet and bidet after we started removing the fixtures. You can see by the floor outlines how crowded this little room actually was. 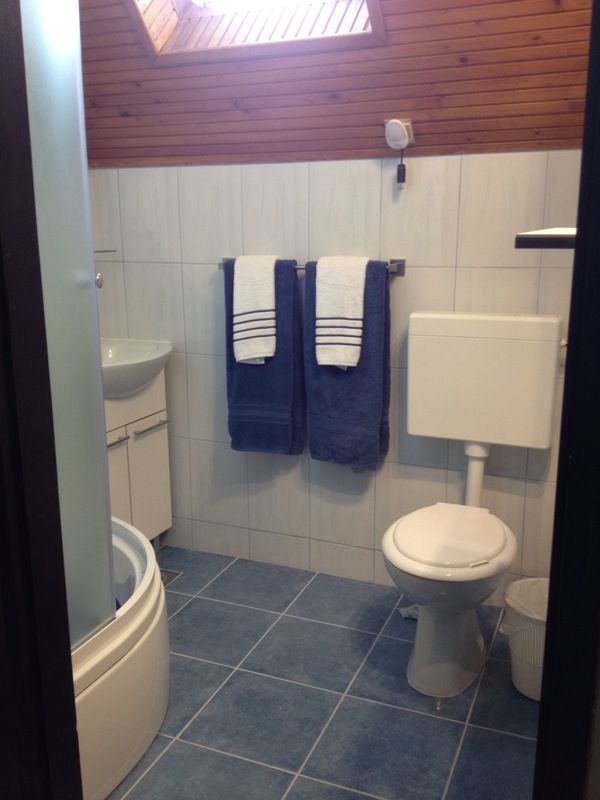 I usually had to step out into the hall after my shower to have a enough room to towel off! 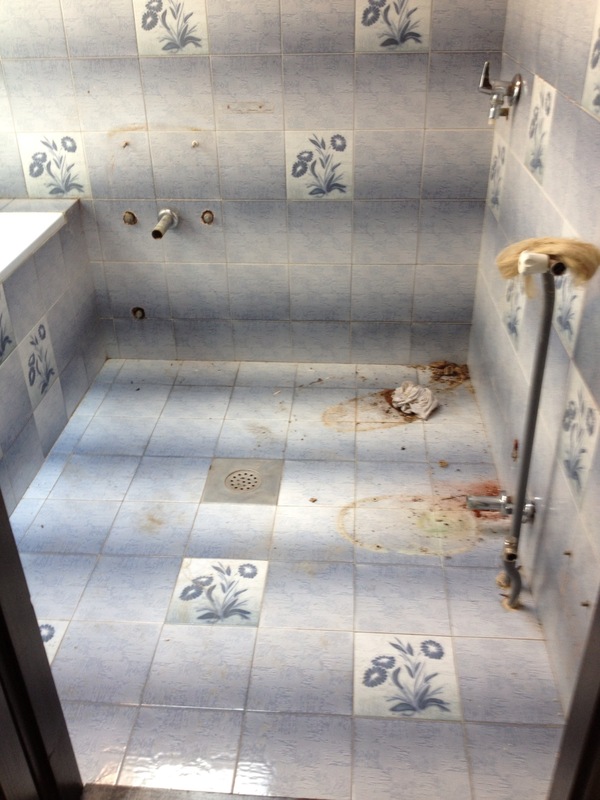 The bathtub has been removed and the old tiles, floor and supports are starting to get jack hammered away. 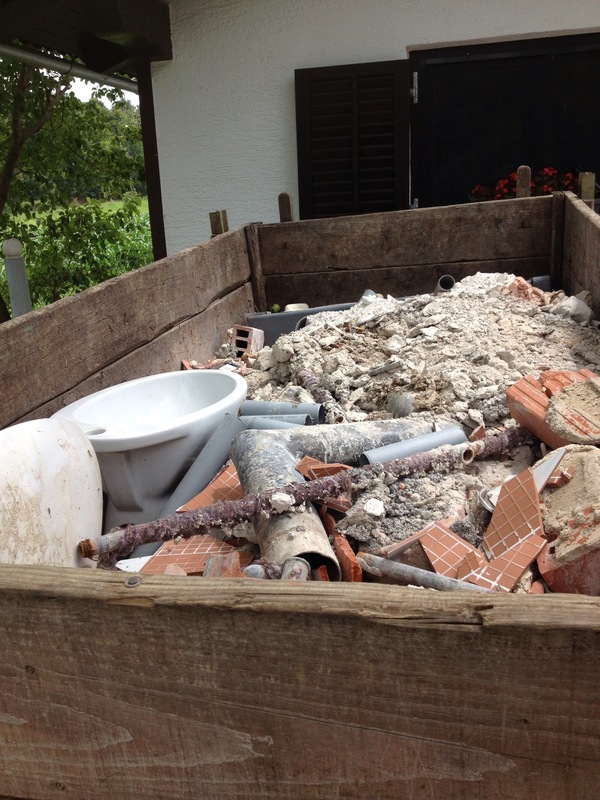 Here is the wagon filled with all of the old fixtures, tiles, walls and flooring ready to be hauled away to the dump. 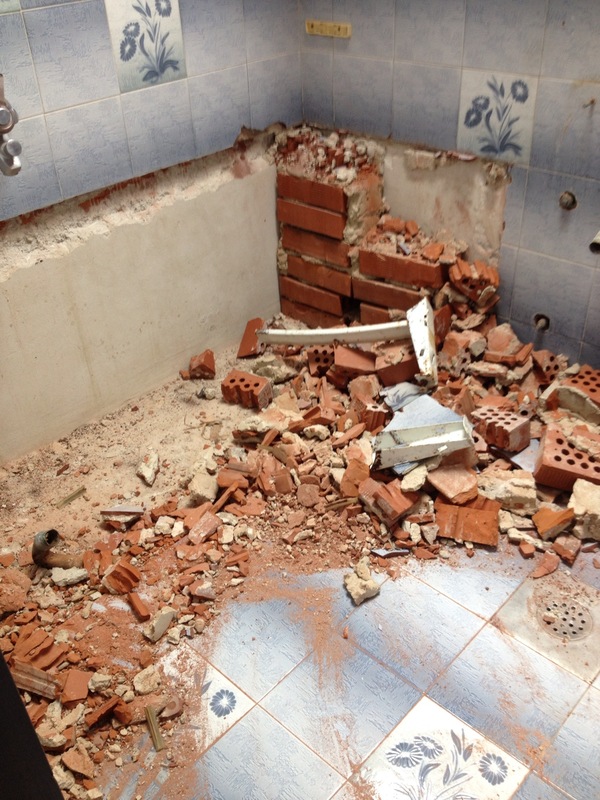 The next step was removing all the tiles and then jack hammering where the new plumbing and drains were to be placed. 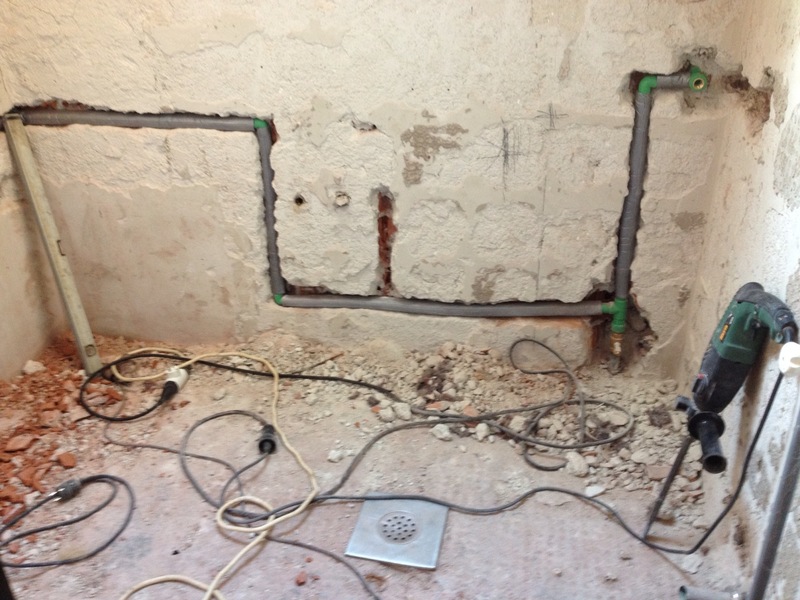 Once all pipes were in place, it’s time to cement everything back into the walls so the tile master can level the surfaces prior to installing the new tiles. All the new fixtures were delivered and placed into a holding area while we were waiting for the tile master to finish his part of the project. 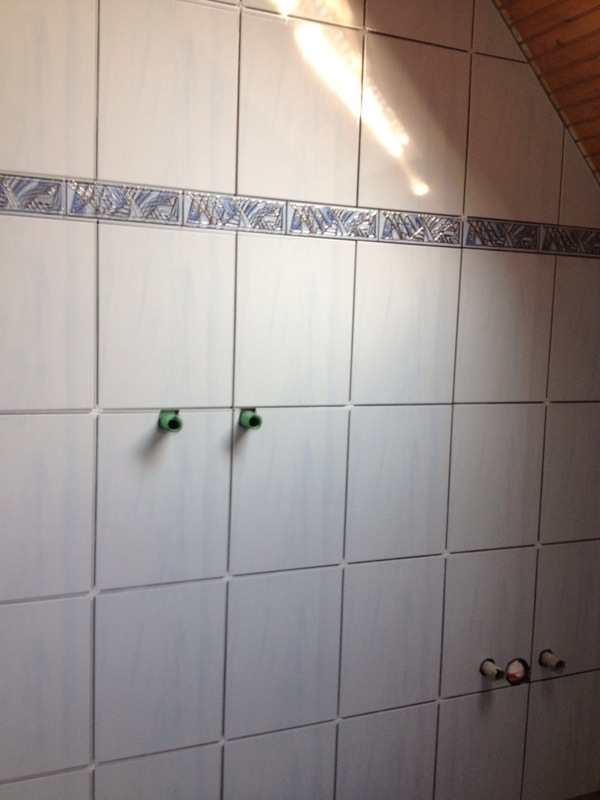 The new tiles all all set and are beautiful! 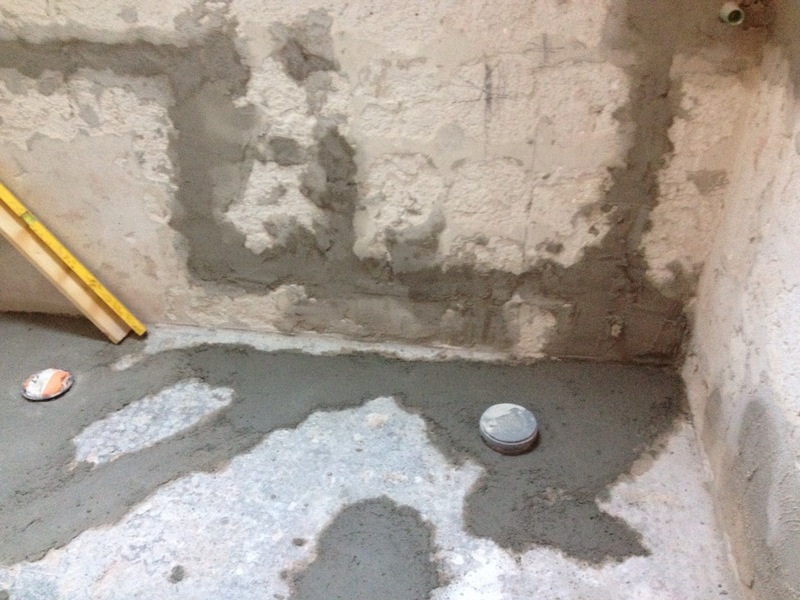 Here is the new shower and part of the sink. And here is the final product….. This is one of the latest pictures taken of the progress being made in the garden. 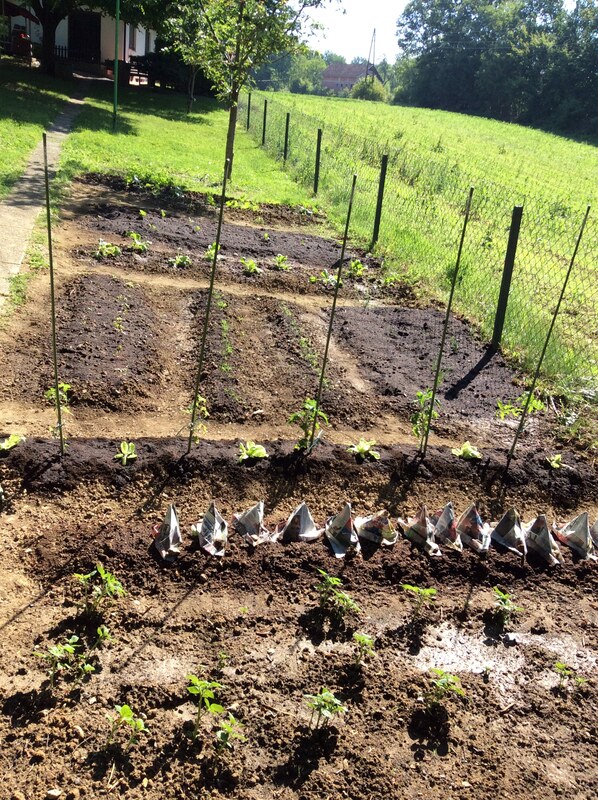 We have already had a few cherry tomatoes, Swiss chard and potatoes, and zucchini. Everything seems to be doing well, although we are having so much rain that the ground has got to be waterlogged by now. 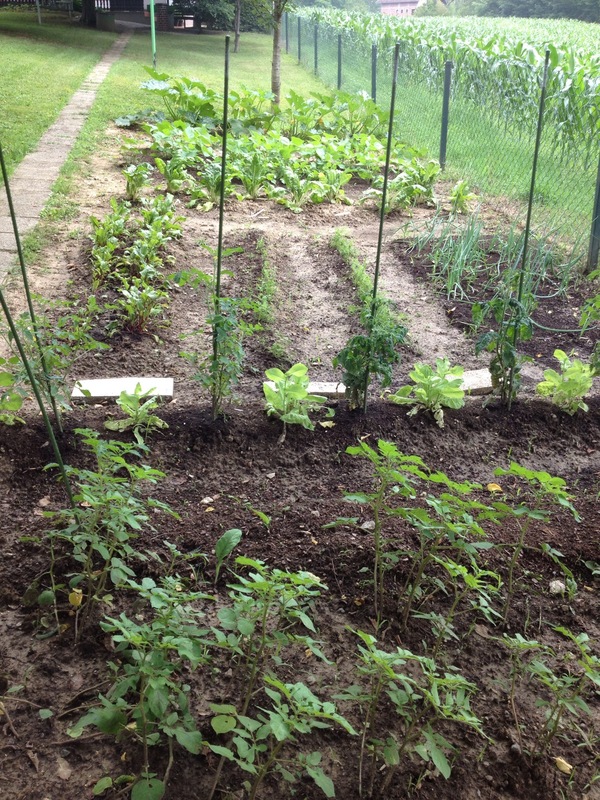 I’m sure the beets and carrots love it, but the onions, tomatoes and potatoes are having a hard time. 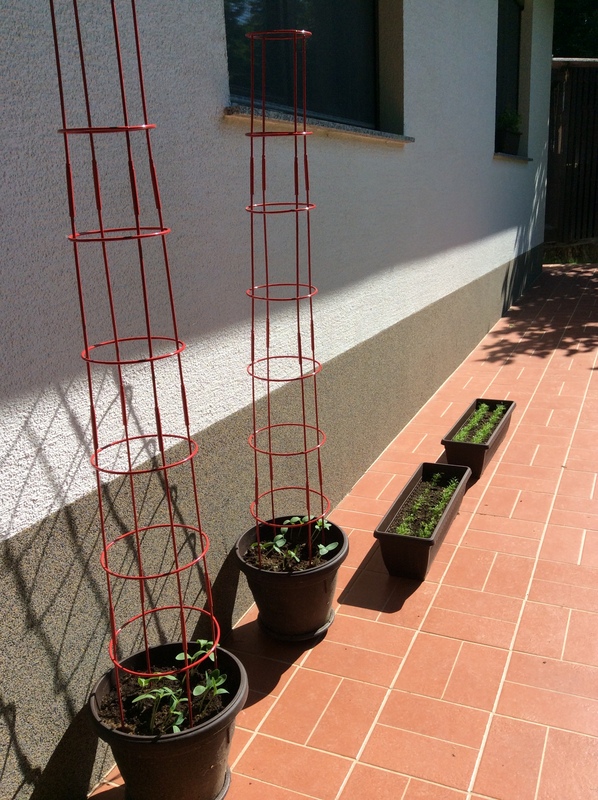 Hopefully it will dry out in a couple of weeks and then all the veggies will have a growth spurt with the warm sunshine shining on them. Speaking of projects, the house is now completely finished in renovations just in time for company arriving. 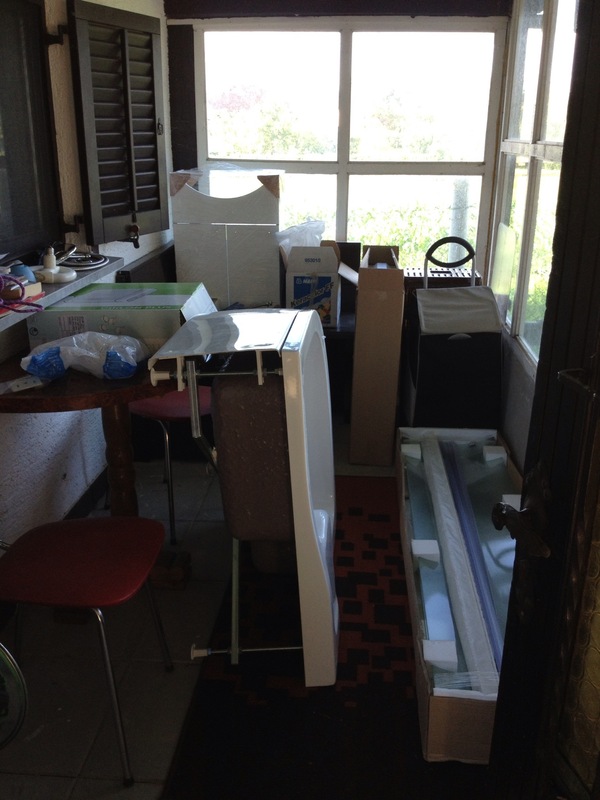 When we underwent a total redo of the house a few years back, we forgot to do the upstairs bathroom. 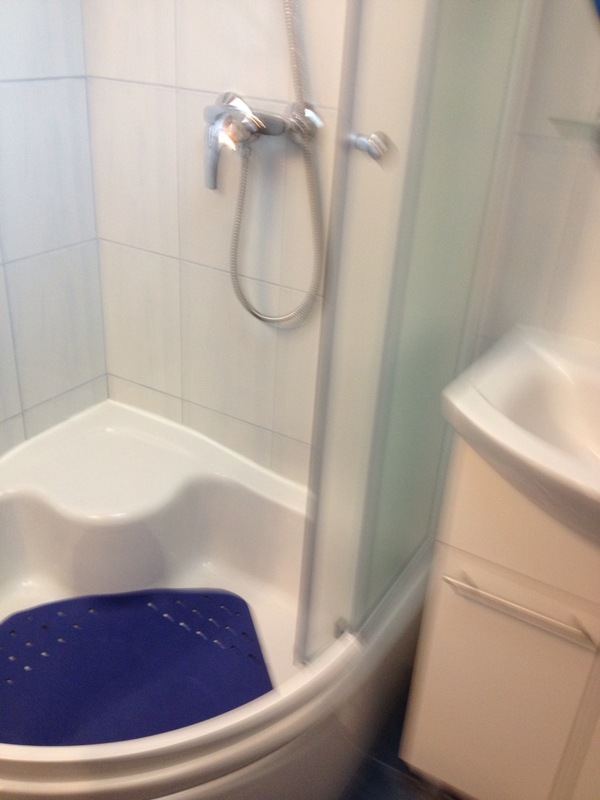 It has been a sore thumb to us ever since….the bathtub was so small you could only put a small child in it, and the toilet had no water tank, just an on/off water valve. 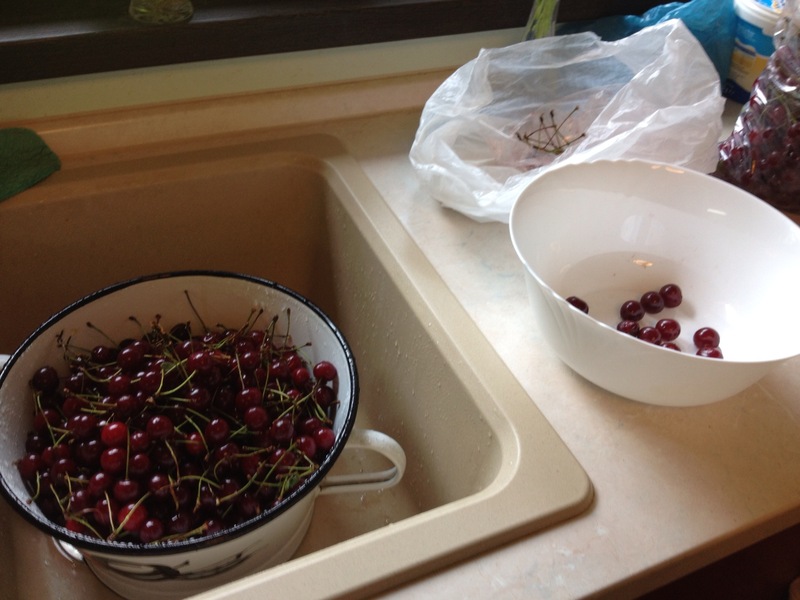 The room is only about 4 feet X 6 feet and a tub, sink, toilet, bidet and radiator were all crammed in that little tiny space……well, its gorgeous now……..I’m culling through pictures and will share them on my next post…..
It’s that time of year to make the most delicious tasting cherry liqueur. There is only a short window of opportunity every year to purchase the small sour cherry and turn it into a smooth, sweet tasting treat. If you are lucky enough to have one of these trees and can harvest them yourself, you will find that you are fighting off the birds for the cherries, so I have learned to look in the local open markets for the already picked fruit and when you find someone selling them, do not hesitate because these cherries go fast! 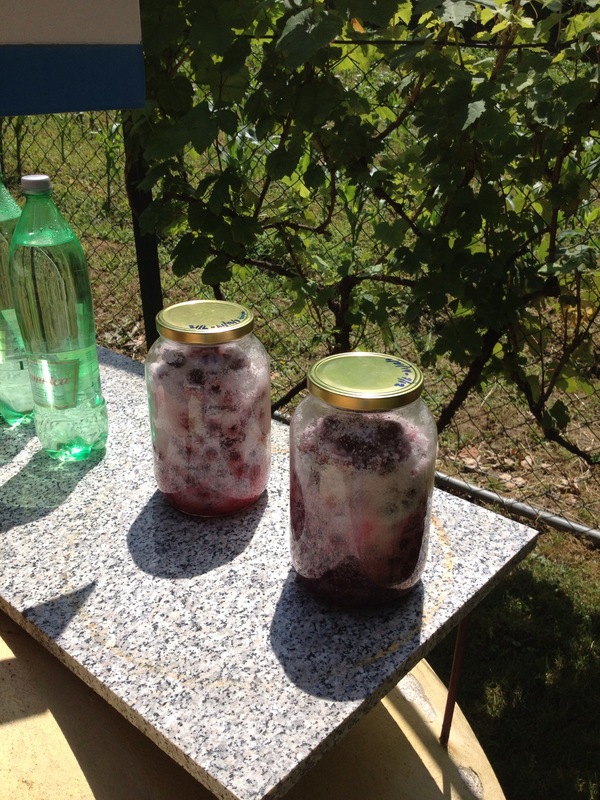 This year a kilo of visnja cost 10 kunas, or the equivalent of $1.80. So, since a kilo is 2.2 pounds you are paying only 81 cents per pound for someone else doing all the work of harvesting, cleaning, packing and bringing the fruit to market….what a deal! First, you have to wash, stem and cull the bad fruit from the good. I do not use any cherries that have a mold growing on them , or which are overly soft as there is a tendency to find little white worms in them, which I personally do not wish to drink, although I don’t think it’s too different from the worm you find in some Tequila, however I am a little squeamish, so I prefer to make sure my cherries are very clean. The next step is to make a slit in the body of the cherry, so that the sugar will be able to interact with the juice and fruit faster and ferment quicker in the glass jar you will use. I make sure I have clean jars ( they don’t have to be sterilized, just washed and dried well) and I have enough sugar for the amount of fruit I will be processing. 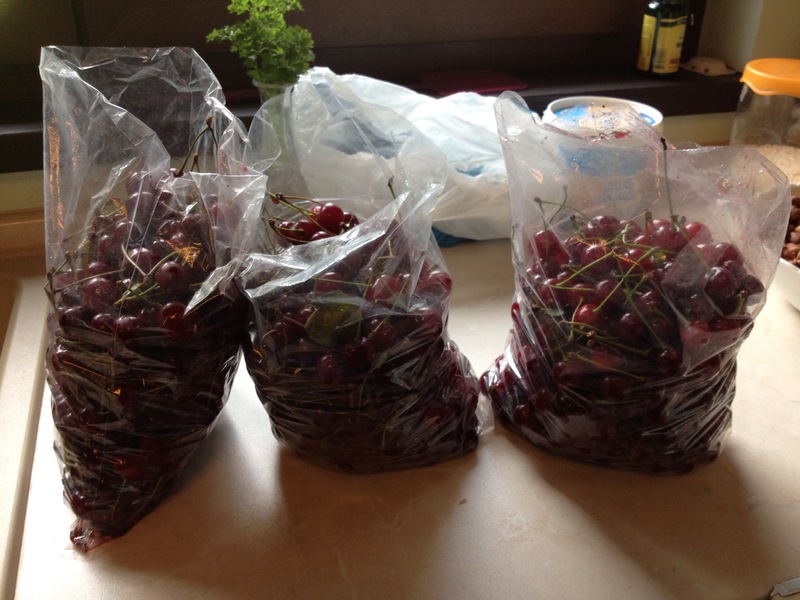 I had enough cherries to use two 2.5 liter glass jars, I ended up with six cups of fruit in each jar and used three cups of sugar per jar. 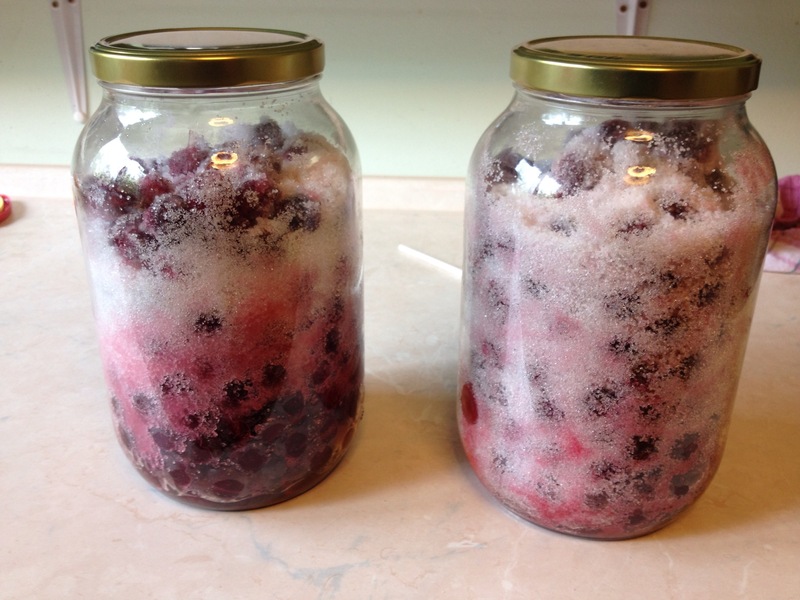 The rule of thumb is one cup sugar to two cups fruit, so make sure you have enough room in your glass jar to accommodate that as well as leave room for the fermentation gasses which occurs when the sugar and the fruit interact together. 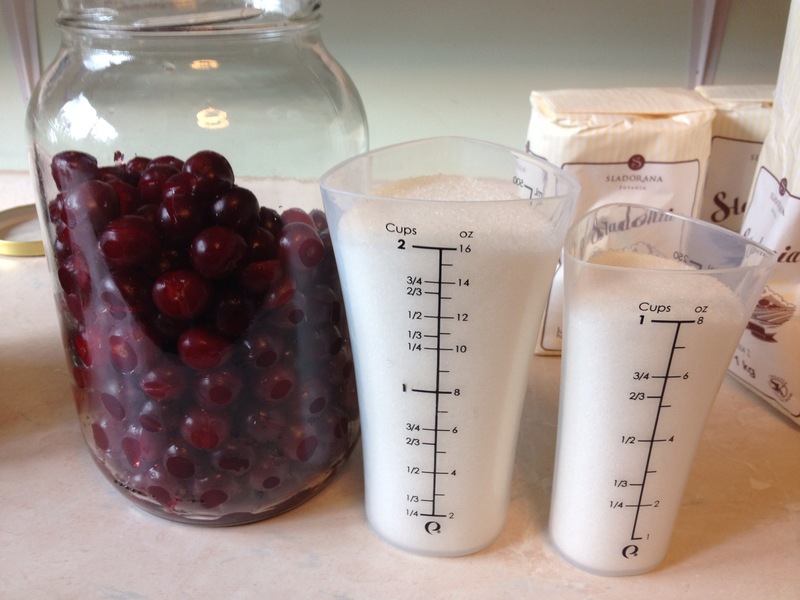 Six cups of cherries to three cups of sugar, add the sugar to the cherries and shake the jar so the fruit is well coated. 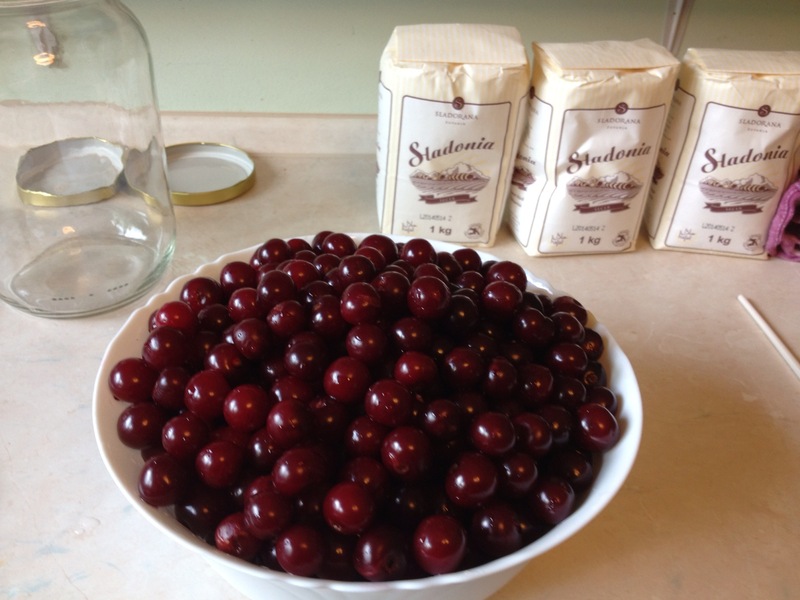 Now comes the alchemy part…..you need to find a warm sunny place to put your jars for three weeks so the sugar can melt and interact with the cherries. You also need to pay attention to the lids you use because if you tighten them too tight the chemical reaction can blow the lids off the jars. If they are too loose, the syrup can ooze out of the top and attract ants and flies ( if you are leaving your jars outside like I do). 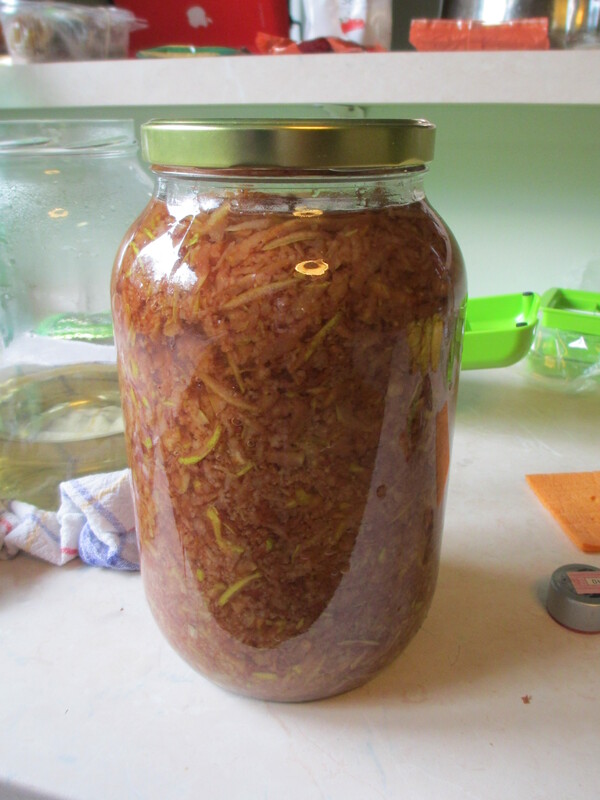 If you decide to keep your jars in the house, find a sunny window and place them there on a towel which can absorb any juices that may leak out during this three week period. You also must shake the contents once or twice a day to ensure that the sugar doesn’t sit on the bottom in a lump without interacting with the fruit. I usually shake the jars first thing in the AM and at night before I go inside for the last time. I also date the lids with the start date and the date I need to process the cherries for the second half of the journey in the transformation into a beautiful liqueur. 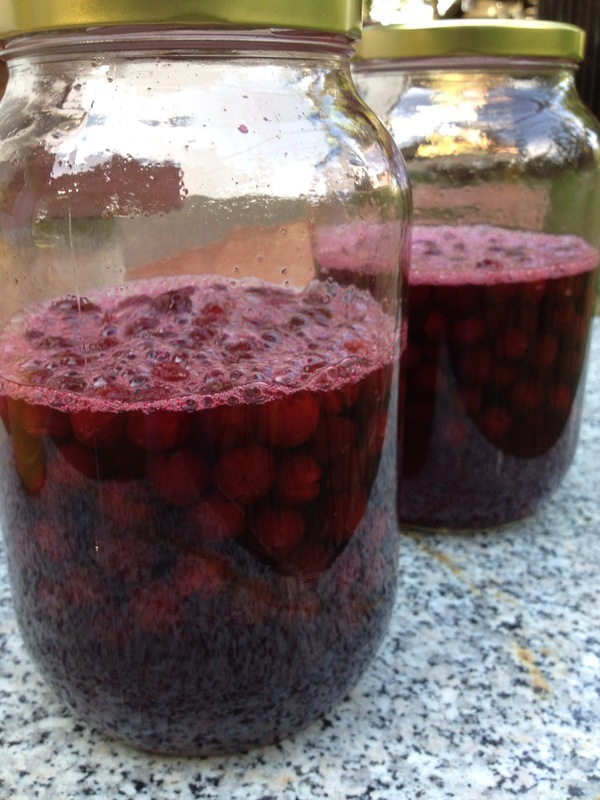 One week in, and you can see that the sugar has melted and the cherries have released their liquid and are fermenting in the sunshine. Okay, now we wait for another couple weeks and I will be back to give you Part Two! Greet my soul with a loving glow. All around me, clamor for air. Only then will you find the Light of the Saints. Totally awakened like never before. Encircled by love they take my hand. Summer solstice arrives tomorrow….the day and night are equal in length and then the days start getting shorter and shorter and we start heading into the second half of the year already! I can not believe that this is our fourth summer here in Croatia. From the very first blog I posted in 2010 to now, with all the adventures, renovations and travels in between, it seems like yesterday, and it seems like an eternity all at the same time. We haven’t been doing much traveling as of yet, partially because we are waiting on the Croatian government giving Becki an ID card to cross the borders more easily, but more because we are saving the big trip to coordinate with Becki’s milestone birthday coming up in August. We will be spending an entire week in Venice Italy in a rented apartment just steps from the famous Rialto Bridge (for those of you who are familiar with the city and its canals). I will have lots to share with you at that time but for now you have to be content with just seeing pictures of our garden growing. 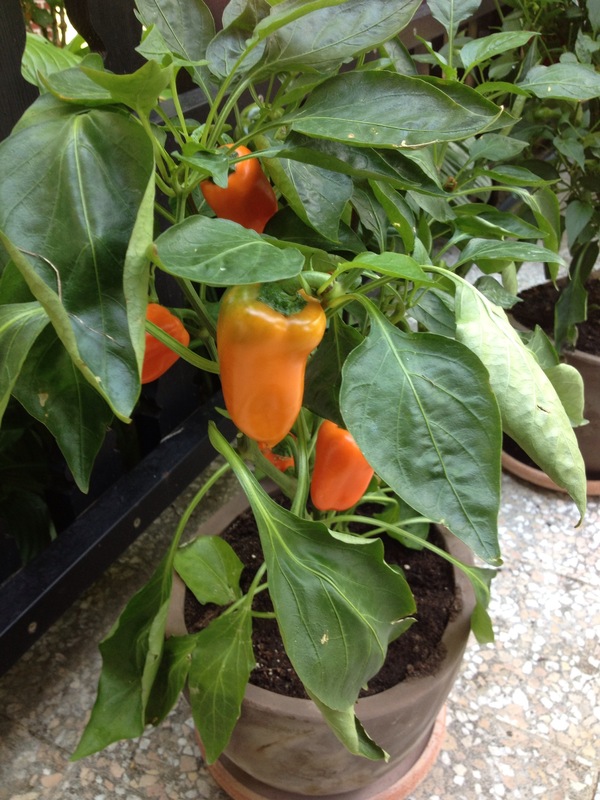 It’s guaranteed to last through the summer and as you pick a pepper another one grows. Unfortunately it is only a seasonal plant so it will die in the fall, but everything we plant and grow dies anyway because there is no one here to tend things year round. We invest a good couple of weeks when we arrive to reseeding the lawns, laying the beauty bark, planting the flower pots and putting in and tending the garden, not to mention ( as I did in the last post) finishing up the straining and bottling of the previous fall’s liqueur batch, and cracking the nuts from our trees to make into flour, chopped nuts for baking, and milk. 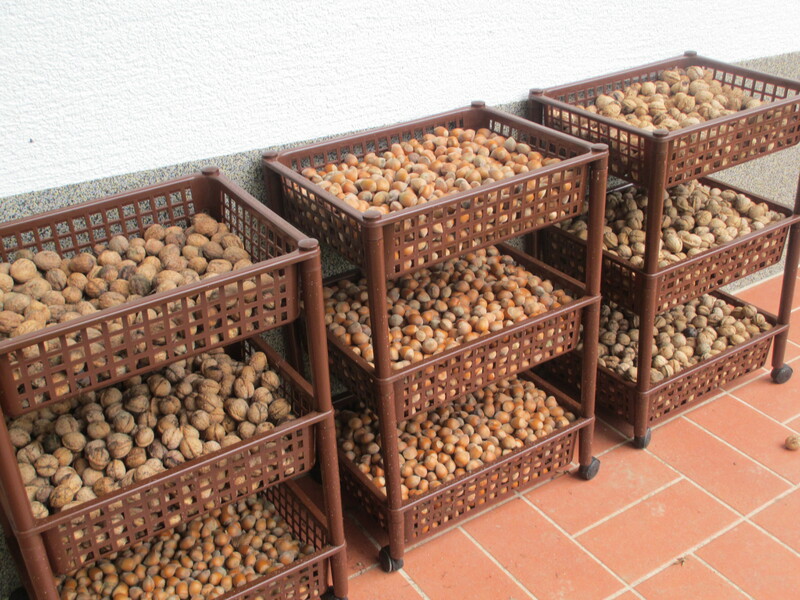 We harvested a bumper crop of walnuts and hazelnuts last fall. 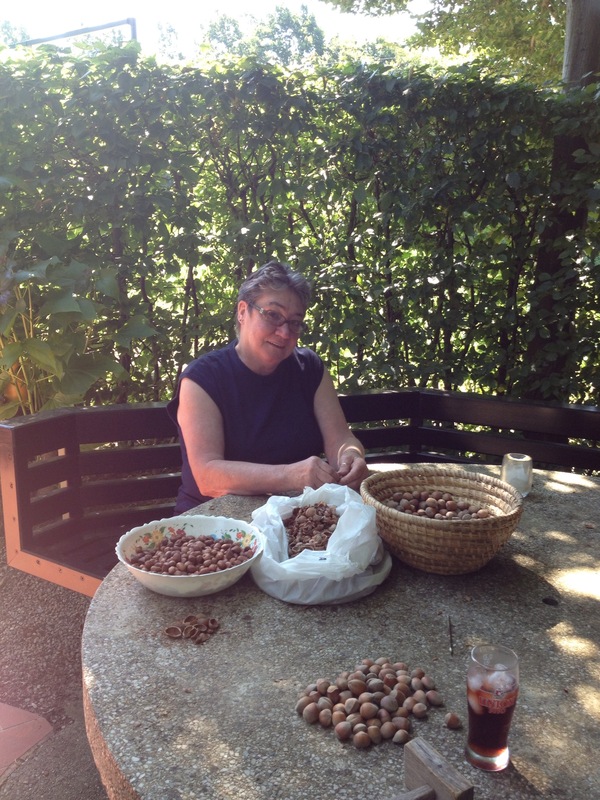 Here’s Becki shelling some of the hazelnuts yesterday. Anyway, I have been busy creating some more new music, as I purchased a new Yamaha PSR750 a couple weeks ago so my keyboards are compatible with each other in both countries, all I have to do is take my USB stick with me and I can work on my stuff on both sides of the world…ahhh, technology is great……I’ve got two laptops with my studios, two keyboards, two iPads…..it makes it so much easier when passing through security checkpoints, just me….no gear! I’ll tease you with some of it in one of my next posts, in the meantime, Happy Solstice and keep raising your vibrations!!!!! 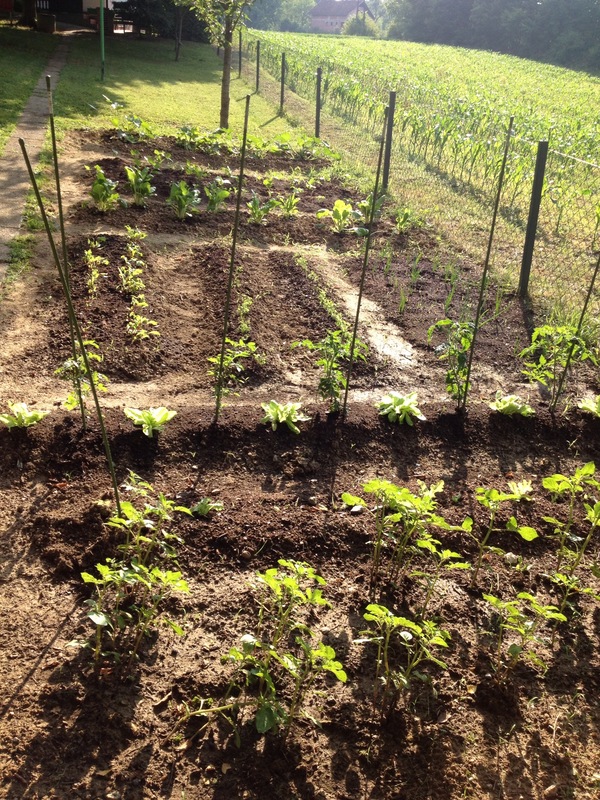 Potatoes in the foreground, new baby lettuce under the paper boat hats, then a row of tomatoes and more lettuce, beets carrots and onions in the next section, then Swiss chard followed by bush beans and finally cucumbers, zucchini, and cantaloupe. 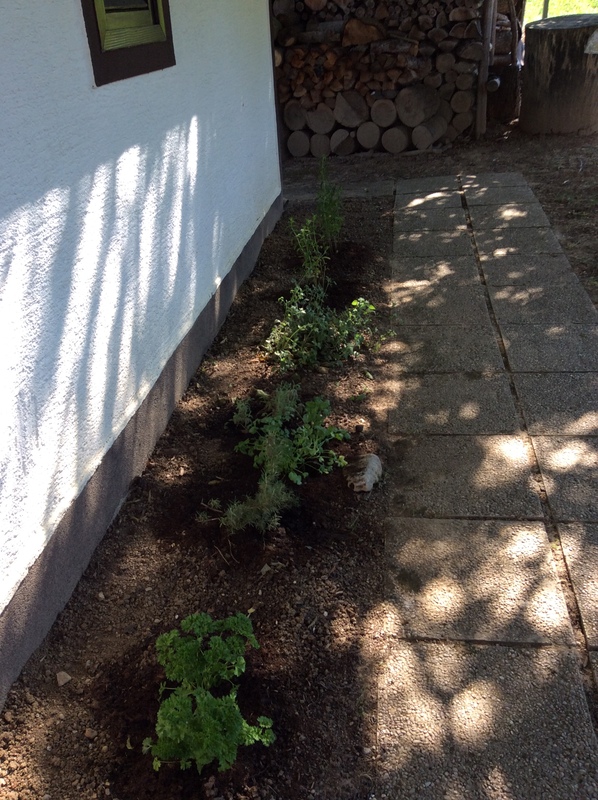 parsley, rosemary and thyme, cilantro and mint. We have been busy getting rid of wasp nests, ant colonies in the garage, killing an infestation of flies in the house from who knows where, reseeding lawns, planting decorative flowers in the planters on the porch, killing aphids and grape disease by spraying with soap and water on the grape vines and roses, and in general doing in two weeks what some folks do all year round! Now we are back at a manageable stage and we can sit back and relax on the terrace at night with a nice cold beverage surveying our handiwork. We have had fun as well, we went to a reception for our neighbor’s daughter who had her second communion, and we took the train to Zagreb and went to the open air market to buy fresh strawberries ( which Becki turned into jam), and we had a BBQ at Drazen’s house with his family and found out that his daughter Nina, whose wedding we attended last June is expecting her first child. Last year before we left for the states we kidded Drazen that he would be a grandfather soon, and he said, no, no way……..well, we should have made a bet on it, cause we were right…next year when we get back here there will be a little stinker running around his place. Both Becki and I wish him to have a boy as he has been surrounded by women in his house, as well as working for us, but as long as the baby is healthy it doesn’t matter if it’s a boy or a girl. 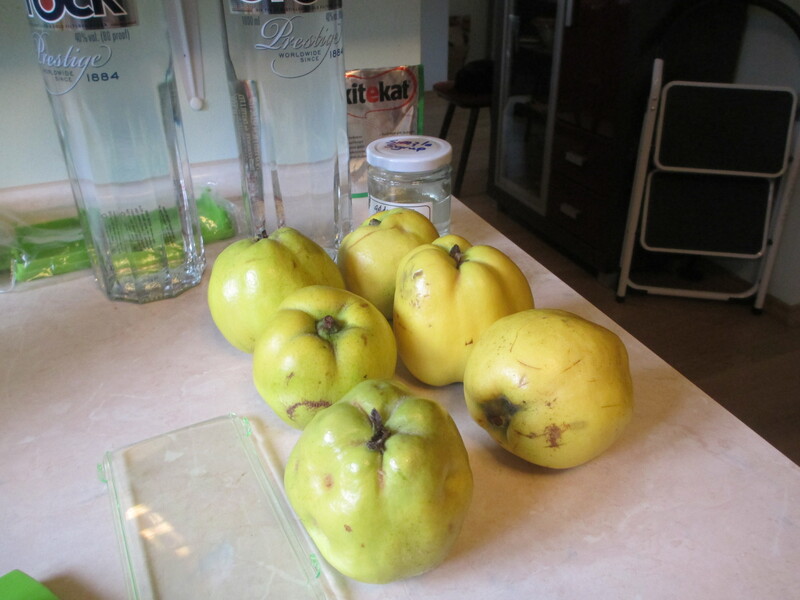 These are quinces, they are like a cross between and apple and a pear. An ancient Middle Eastern fruit. After being sliced, diced, bathed in Vodka and cinnamon and ready to put away over the winter. Here is the final product…..it’s tastes as good as it looks! Just posting about it has made me thirsty! 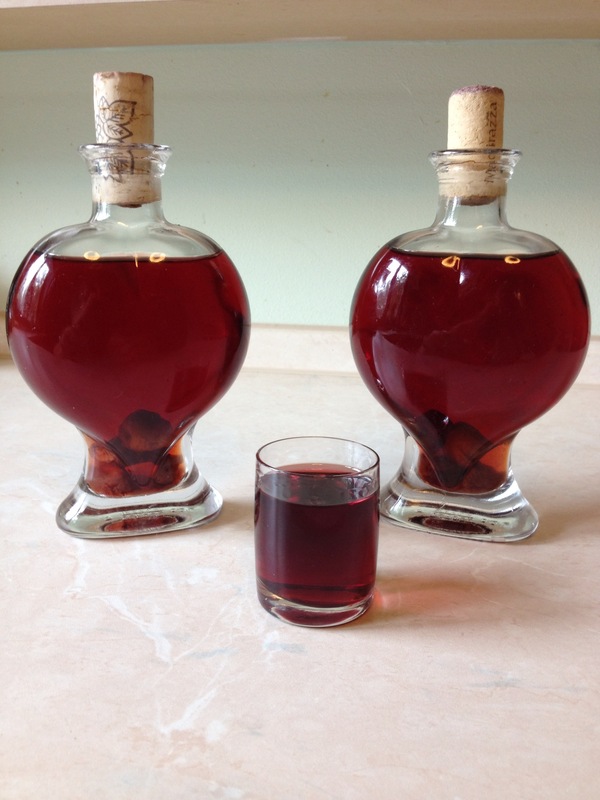 Those of you that come visit can sample my homemade cherry and walnut liqueur as well! See you again soon, and I hope it won’t be as long as last time! I just wanted to give a shout out to everyone who has served in the US Military, and THANK YOU for your service! It’s easy for us to all think that Memorial Day is the start of summer vacation travel, BBQs, and picnics, but we wouldn’t be able to celebrate this day without the sacrifices our veterans made for us. Thank you, thank you………and to my dad, who is a Battle of the Bulge survivor and is still alive and kicking (strongly) at 94 1/2…I thank you for surviving that year you spent in the army hospital with shrapnel in your body and having the will to go on because you believed in your adopted country, the USA. I am now living in your birth country and Becki and I had the Croatian equivalent of hamburgers and hotdogs on the grill and flew the American flag proudly today. I don’t have a picture of today’s dinner but I do have one of the fantastic duck dinner we had on Saturday. 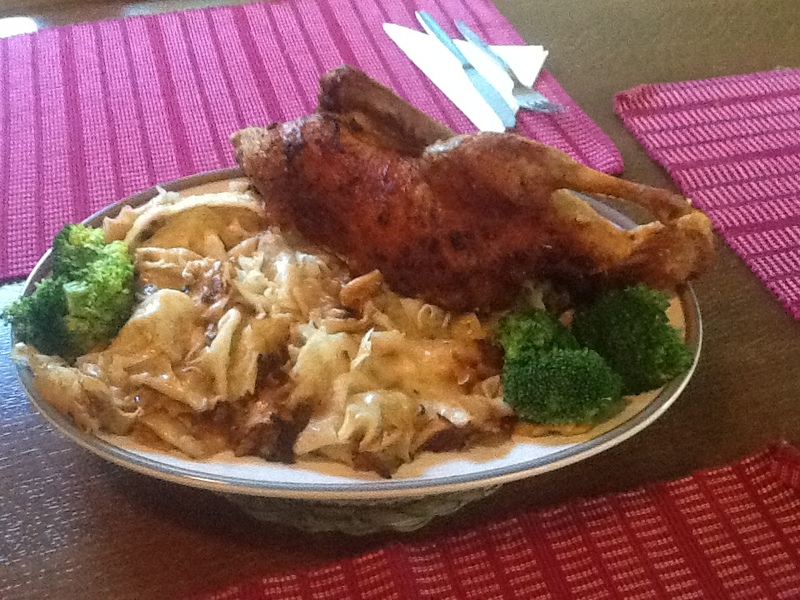 Fresh young roast duck with mlinci and broccoli. One of my favorites! 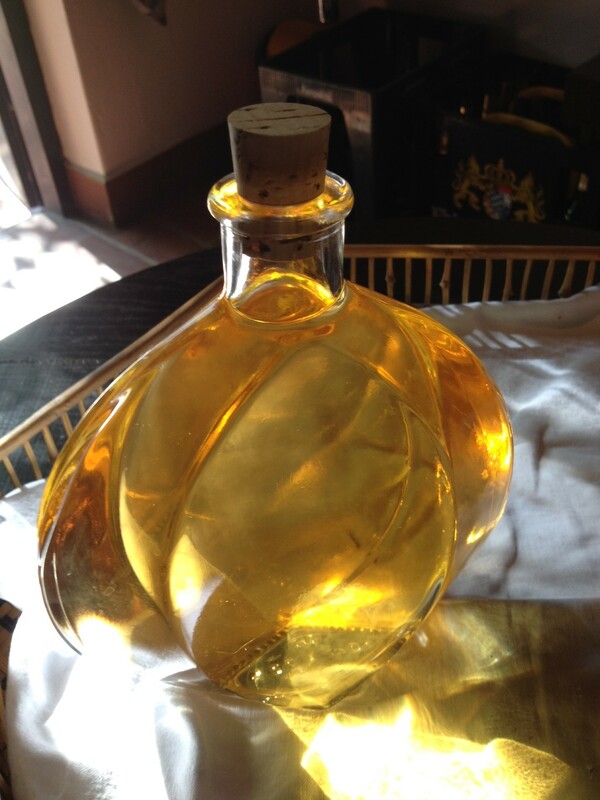 Anyone who visits us here in Donja Stubica will need to partake of this regional favorite. I think we have the recipe down pat and if we ever open our place as a B and B ( which is a goal ) this will be on the menu. We got some more rain today, along with a lot of thunder and lightning. The garden got a good soaking and everything smells fresher after a Spring rain. Tomorrow I will be working in the back laying bark down and finishing planting the rest of the flowers we bought this past weekend at the Saturday market. Have a great rest of the Holiday weekend and see you soon! When in the way is my humanity? Making my planet so diseased. How close her end is near. to feel how close to God you’re near. For all creatures great and small. Let me know what you think…….